Remember when Hans Solo got himself frozen in Carbonite during the movie “Star Wars, The Empire Strikes Back”? During Disney’s “Star Wars Weekends” event at Disney Hollywood Studios (in Orlando), you too can get yourself frozen in Carbonite – without the actual risk of having to survive the freezing process or deal with hibernation sickness, which affected Hans Solo when he thawed out. Disney has set up what they are calling a Carbon-Freeze Me experience. After stepping into the Carbonite Freezing Chamber, you’ll be shot by several special cameras. 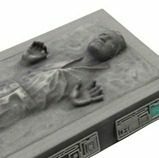 A 3D image is created, and your likeness will be used to create a mini version of a Carbonite block displaying with you embedded in the Carbonite. By the way, the likeness they are capturing in the Carbonite Freezing Chamber is not full body. Only your face is captured in the imaging process. I know… that takes some of the fun out of it. Right? The rest of the body is apparently modeled by Hans Solo himself. Yep, your face, on a frozen Hans Solo body. The price? $100, plus shipping. According to the DisneyParks blog, it will take about four weeks to get the 8 inch block made and delivered to your door. The Carbon-Freeze Me experience will be part of Disney’s Star Wars Weekends, which take place on every Friday, Saturday and Sunday. The event begins May 18 and runs through June 10. Reservations are required for the Carbon-Freeze Me experience. According to Disney, a credit card will be required to make a reservation, and there will be a $25 fee charged if the reservation is cancelled within 48 hours of the appointment, or if you don’t show up. The number Disney published for reservations is 1-407-939-8324. And alas, according to Steven Miller, Merchandise Communications Manager for Disney, no discounts are honored, including AP, Cast Member, Passholder or Disney Visa merchandise discounts.